Bantamweight contender Aljamain Sterling recently withdrew from a planned UFC Fight Night 102 bout with Raphael Assuncao. With few acceptable options in front of him, Assuncao has decided to wait for Sterling to recover. 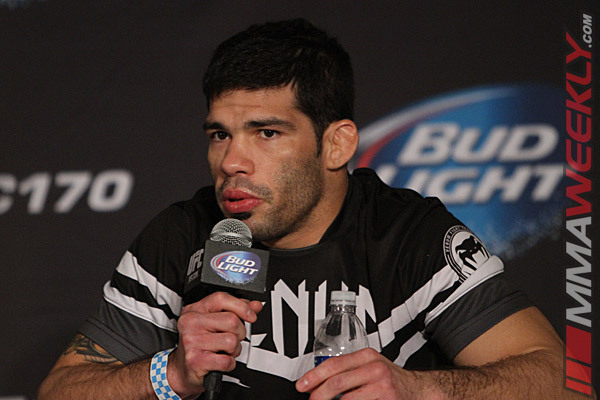 UFC officials on Monday announced that the fight was canceled, per Assuncao’s decision to wait. With Assuncao ranked No. 3 in the UFC bantamweight division and Sterling seated at No. 8, theirs is a pivotal match-up in the division. It’s also a bout that will be sorely missed on a fight card lacking in high-profile fights. UFC Fight Night 102 features a headlining bout between Top 15 ranked heavyweights Derrick Lewis and Shamil Abdurakhimov. It takes place on Friday, Dec. 9, at Times Union Center in Albany, N.Y.